Soaker hoses are a form of trickle or drip irrigation. They are usually manufactured from recycled tires; water leaks slowly and evenly from tiny holes or pores along the length of a soaker hose. Sprinklers come in a variety of models some of which direct oscillating and pulsing spray into the air onto turf, gardens or flowers. The pressure and volume of water in soaker hoses are regulated by adjusting the faucet. The water leaks evenly onto the soil. The water will spread 2 to 3 feet on either side of the hose depending on the soil type. A 100-foot soaker hose will use about 30 gallons per hour. 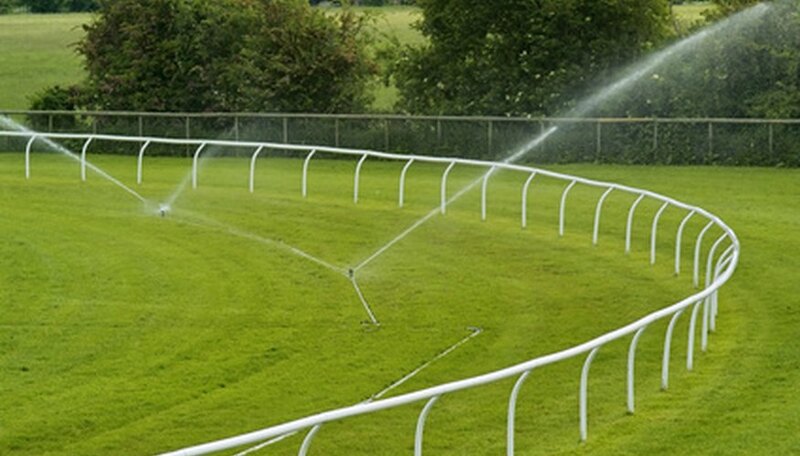 Rotary sprinklers produce a fine spray of water; the distance of the spray can be controlled with some models. A curved arm on oscillating sprinklers moves from side to side shooting spray out of small holes. Pulsating sprinklers moves the spray in circles, shooting it out in pulses. Tiny holes in the top of sprinkler hoses shoot water into the air. Roots supply plants with the water they need. Water from soaker hoses is not lost through evaporation, and the water is not wasted on leaves; it goes to the roots where it is needed. The slow drip of water can easily be directed at the roots of flowers, shrubs and vegetables. Roots can be soaked anytime day or night. Using a soaker reduces damages to blossoms and problems of mildew, rust and other bacterial fungal diseases that often accompany plants soaked by sprinklers. A soaker system can help keep the soil cool in the heat of summer. Plants grow better and produce more in cooler soil. Agronomists at Cornell University say using a soaker reduces the amount of water needed for vegetables or flowers by 50 percent compared to sprinkler irrigation systems. Soaker hoses stretched more than 200 feet for a single flower bed or row of vegetables are not very effective. Impure water may clog soaker hoses. Soaker hoses have to be moved frequently on large areas of turf to prevent alternating green and brown areas. The chief advantage of sprinklers is for lawn use where broad areas need to be watered. Sprinklers do not have to be moved as often as soaker hoses to ensure that the entire lawn is watered. Saturating soil with large amounts of water from a sprinkler can cause soil to compact. Watering vegetable gardens and flower beds with a sprinkler can result in muddy areas where the water wasn't needed; this encourages weeds. In hot weather, water from a sprinkler can evaporate before it gets to the soil. Sprinkling should be run early in the morning so the sun can dry the leaves during the day. The wind can blow water from a sprinkler to places where it isn't needed including the yards of neighbors.